HÀ NỘI — Vietnamese shares edged up slightly on Wednesday afternoon as investors tried to lock in profits after the benchmark VN-Index surpassed the 1,000-point level, before falling back. 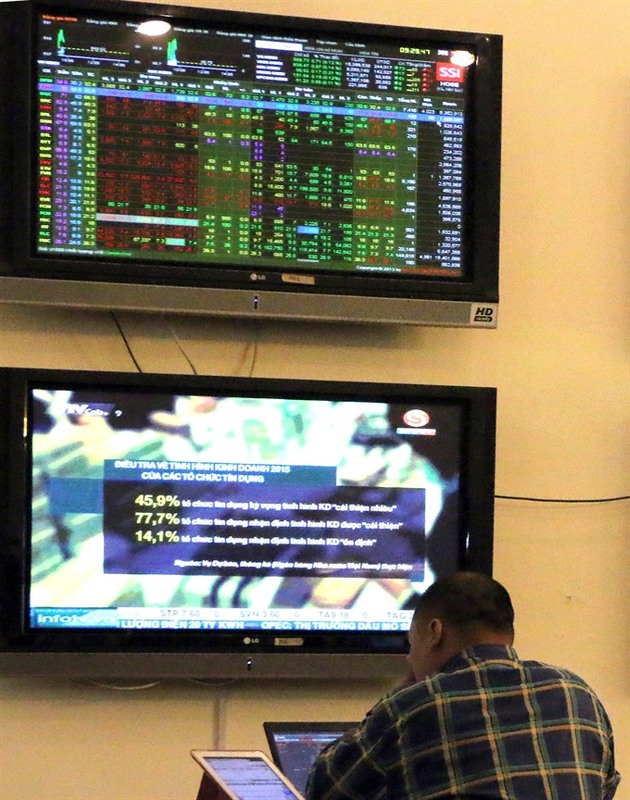 The VN-Index on the HCM Stock Exchange gained 0.21 per cent to close at 995.54 points. It rose as much as 0.84 per cent during the day. The southern market index has totalled a two-day increase of 0.80 per cent. The HNX Index on the Hà Nội Stock Exchange was up 0.53 per cent to end at 114.20 points, extending growth from an increase of 0.74 per cent on Tuesday. More than 307.6 million shares were traded on the two local exchanges, worth VNĐ5.95 trillion (US$264.4 million). The market trading condition was positive with 247 gaining stocks, 193 declining stocks and 129 others ending flat. After surpassing the landmark of 1,000 points in the morning, the VN-Index encountered strong selling pressure as investors intended to take profits from the benchmark’s rally, which has lasted since early September. The benchmark VN-Index had gained 3.68 per cent since September 6 to touch nearly 1,000 points. The index had previously neared the 1,000-point level on August 30. According to Sài Gòn-Hà Nội Securities JSC (SHS), the 1,000-point peak again triggered selling pressure that hit high-valued stocks – the same scenario seen on August 31 when the VN-Index hit 998 points. All sectors that had seen strong growth on Wednesday morning narrowed their gains in the afternoon session, including financial-banking, energy and retail, data on vietstock.vn showed. The large-cap VN30 Index rose 0.31 per cent to stand at 962.70 points at the end of the day, compared to its intraday maximum growth of nearly 1 per cent. After touching 998 points on August 30, the VN-Index fell total 4 per cent to 958.19 points on September 6. “The market condition is better now than the last time the VN-Index was near 1,000 points as the market was able to maintain its positive trend and trading liquidity remained strong,” SHS said in its daily report.